James Romm is James H. Ottaway Jr., Professor of Classics at Bard College. He has received fellowships from the Guggenheim Foundation and the National Endowment for the Humanities. His books include The Edges of the Earth in Ancient Thought and the forthcoming Ghost on the Throne: The Death of Alexander the Great and the War for Crown and Empire. 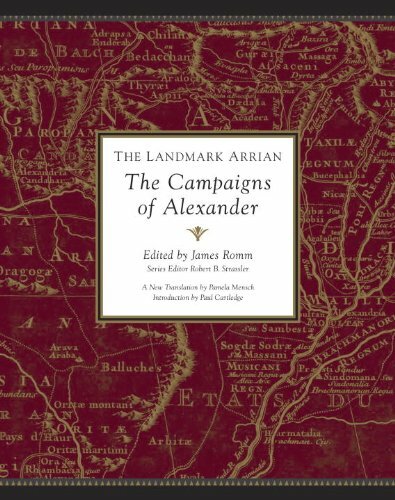 Allan Vorda: How did you get involved in this massive undertaking of editing Arrian’s Anabasis Alexandrou? What type of research was done and how long did this enterprise take to complete under the title of The Landmark Arrian? James Romm: It took about five years, but the last year was the equivalent of three normal ones. The research involved goes back even further, as I have been studying Alexander for at least a decade. AV: Arrian states (p. 77) the war against the Persians was “not sprung from enmity but was a lawful struggle for the sovereignty of Asia.” Isn’t this statement somewhat incongruous as far as it being lawful and that there was enmity due to previous wars with Persia? JR: I have to correct you and point out that the statement is Alexander’s, not Arrian’s. But yes, it’s a hard statement to understand. Alexander seems to be making a distinction between a purely political struggle, where normal rules of engagement apply, and a grudge match where anything goes. But he elsewhere does express hatred of Darius and a sense of personal grievance. So there’s some inconsistency. AV: Upon the defeat of the Persians at Issus, Darius’s mother prostrates herself in front of Hephaistion (as he appeared the taller) thinking he is Alexander. When she learns of her mistake, she apologizes whereupon Alexander tells her (p. 77) there is no error as “Hephaistion, too, is Alexander.” What do you make of this scene and Alexander’s comment? JR: I don’t understand this comment, and I don’t think anyone does. Maybe Arrian himself did not understand it. AV: You state (p. 78, note #2.12.8b) that some historians believe Darius’ wife bore Alexander a child in 331 B.C.E. What can you add to this rumor and that Alexander later married the queen’s daughter? JR: We have the testimony of one source that the queen died in childbirth. Whose child was she bearing? It could have been Alexander’s, but there’s no hard evidence. I don’t think it would have bothered Alexander to be involved first with the mother and later with the daughter. AV: You mention (p. 79, note #2.13.7b) the defection of the Phoenicians and their navy from the Persians to Alexander. How critical was this in the war? JR: Extremely critical, in the battle for Tyre in particular. The mole which Alexander constructed to reach Tyre from land did not allow him to bring his siege weapons to bear against the walls. The defection of the Phoenician ships gave him control of the sea and allowed him to bring ship-mounted engines right up to the walls. That was the turning point in the seven-month siege. AV: Arrian states in the battle of Tyre that 8,000 Tyrians were killed and 30,000 captured and sold. Other reports (p. 94, note #2.24a) state Alexander crucified 2,000 males. What do you make of this and Alexander’s cruelty? JR: I think Arrian omitted mention of an episode that showed Alexander in a poor light. He does this on numerous occasions. We cannot be certain the crucifixions occurred, but it seems likely that some of the episodes Arrian omits were factual, and this may be one of them. Certainly Alexander was capable of cruelty and acts of collective punishment when his will was thwarted. AV: Arrian’s list of Darius’s troops (p. 112 and p. 119) at Gaugamela includes 1,000,000 soldiers, 40,000 cavalry, 200 scythe-bearing chariots, and 15 elephants. The Macedonians have 75,000 troops and yet win at Gaugamela. Surely, this must be a gross exaggeration. JR: All troop counts of Alexander’s enemies in the Anabasis are exaggerated, but the fault lies more with Arrian’s sources than with Arrian. That said, the Persians were capable of putting huge numbers of troops in the field. They outnumbered the Macedonians at Gaugamela several times over, but many of their infantry lacked adequate training and equipment. AV: It seems Arrian glorifies Alexander and the Macedonians (p. 114, Note #3.10.2a) “in heroic poses.” This constant glorification runs counter to Homer’s Iliad that showcased many Persians as noble and brave. Why didn’t Arrian temper his comments to be more realistic? JR: The Iliad is a more compelling story because it’s a fight between two noble adversaries. But few storytellers are as talented as Homer. The superhero narrative, which focuses on the glory and virtue of one leader at the expense of the other, is easier on both the author and the audience. Also, the Roman world in which Arrian lived was more unipolar than that of Alexander. His attitudes toward the barbarian world, and the East, were partly the product of his times.